It is the great wit of this thoughtful book to juxtapose the silence of punishment with the silence of spiritual life and, in so doing, to deepen our understanding of each. In her stunning new book, Silence, Jane Brox has once again taken a seemingly familiar subject and made it the focus of her laser-like attention and lyrical prose, bringing readers along on a journey of investigation they will never forget. Working from two extremes—silence as solace to the contemplative spirit, silence as punishment for the rebellious or merely unlawful—Brox uncovers a history that both shocks and soothes. 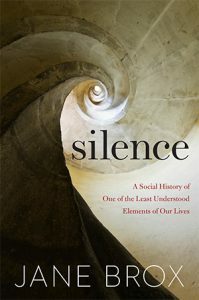 Silence is an uncommon book on an increasingly uncommon phenomenon, a gift to be treasured in the din of daily life. Brox approaches the social history of silence from an obvious (in retrospect) and significant place: solitary confinement in America’s prison system. Her disturbing history of Eastern State Penitentiary, near Philadelphia, a facility designed and built with the complete silence of its inmates as a central tenet, will stun readers with its Founding Father origins and far-reaching consequences. Gracefully shifting from that dark and desperate locale, Brox moves to the sustaining silence embraced by American Trappist monk, activist, and writer Thomas Merton, then turns to the historical use of enforced silence as punishment against women. With each skillful shift in her narrative, Brox reveals how easily silence has been woven into society, where it is used alternately as weapon and balm. Her ability to juxtapose prisons and monasteries, fear and peace is remarkable, and her graceful prose, which appears effortless, draws upon a wealth of research. This is history at its most effective: elegant, essential, and provocative. Those with an interest in prison reform should be particularly drawn to these thought-provoking pages. Gal Beckerman discusses Silence with Book Review editor Pamela Paul.